Eusebio Di Francesco's Roma head for Chievo on Friday looking to build momentum before their Champions League onslaught as the battle for Europe also heats up in the Italian league this weekend. Behind runaway leaders Juventus -- who have 60 points from 22 games -- and second-placed Napoli, nine points behind, the remaining two tickets for the elite European competition and the Europa League berths remain up for grabs with 10 teams in the running. Luciano Spalletti's side have 40 points, but are now just four ahead of city rivals AC Milan and five ahead of pursuing Atalanta, AS Roma and Lazio. 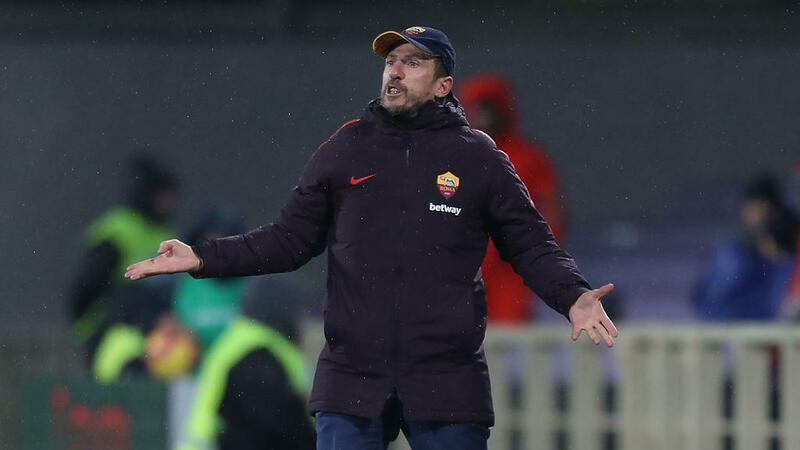 The pressure remains firmly on Roma coach Di Francesco after his side's humiliating 7-1 Coppa Italia elimination by Fiorentina. And the side from the capital head to Verona looking for a confidence-boost against the league's bottom club, before their Champions League last 16 first leg tie against Porto in Rome next Tuesday. "I've said to the boys that when you're under the rubble you need to shake it off step by step," said Di Francesco. "We need to try and build some consistency." Di Francesco's side have taken just two points from the last two league games and were held 2-2 by Chievo in Rome last September. Inter coach Spalletti's future is also under the spotlight after crashing out of the Champions League and Italian Cup have gotten off to their worst start to the year in seven years. The northerners face a tricky trip on Saturday to promoted Parma, who are 12th, but still in the running for the Europa League thanks to Ivorian veteran Gervinho, whose brace snatched a 3-3 draw against Juventus last weekend. Lazio will have a chance to move into the top four on Thursday when they kick off the 23rd round of matches against relegation Empoli. AC Milan boosted by new Polish signing Krzysztof Piatek will host lowly Cagliari in the final match of the weekend on Sunday. Atalanta have Champions League aspirations and are just one point behind AC Milan in fifth before hosting SPAL. Champions Juventus are looking to get back to business at Sassuolo after their Coppa Italia exit to Atalanta and being frustrated by Parma as they look to extend their already comfortable cushion on Napoli. Massimiliano Allegri's side are still without defensive trio Andrea Barzagli, Leonardo Bonucci and Giorgio Chiellini before their trip to Atletico Madrid in the Champions League on February 20. Carlo Ancelotti's Napoli visit Fiorentina, who are also targeting the European places, with the future of captain Marek Hamsik still in doubt after his planned move to China fell through.